As the last vestiges of daylight fade, the rocky shoreline grows darker until black against the orange-kissed sky. On the eastern point of New Providence, Solomon’s lighthouse stands boldly as it bids the day farewell. 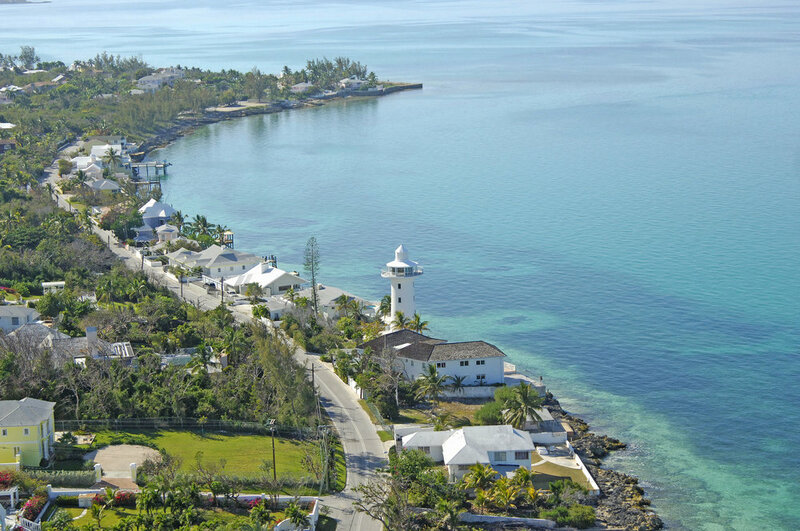 There’s no doubt that our predecessors chose the eastern periphery of Nassau for both the favoring summery breezes that blow from the east and the unobstructed, boundless views of the Bahamian archipelago beyond. Long before the gated communities of today, Nassau’s Eastern Road was where the who’s who built their lives. Dating back to the early 1950s, Solomon’s Lighthouse was never operational; it was constructed as a capricious seaside abode, five floors complete with kitchen and two bedrooms, crowned by an eagle’s nest with front row seats to the comings and goings of Nassau’s bustling Harbour. Lighthouse with A Pool. And Why Not? If you can dream up a lighthouse as a residence, then why not add a pool? Conceived by the distinguished British classical architect, Alireza Sagharchi, a longtime favorite of H.R.H. The Prince of Wales, Solomon’s Lighthouse has seen some more “dreamscaping” over the past five years, specifically the amalgamation of the neighbouring seafront lot to include a British colonial style Main House and 90ft horizon pool, reached from the landmark lighthouse by a stone-clad bridge. “We are such stuff as dreams are made of” said the magician Prospero in Shakespeare’s The Tempest. Tea in the crow’s nest darling or chilled Rosé by the pool? In keeping with the colourful tapestry of our physical environment, history and culture, The Bahamas, as an event destination, offers a plethora of unique venues and spaces. From cutting-edge convention centers of Atlantis and Baha Mar, to intimate retreats such as HopeTown Harbour Lodge, The Cove Eleuthera, and the more avant-garde creative spaces of The National Art Gallery of The Bahamas, The D’Aguilar Foundation, or The Current at Baha Mar, The Bahamas really is the hostess with the mostest.